AfroShe is based in Canberra (Australian Capital Territory). How are the shipping costs calculated? There are two (2) shipping categories...1) Australian parcels (domestic) & 2) International parcels. Australian (domestic) parcels are calculated by weight and state. International parcels are calculated by weight and country. Which countries do you ship to and what are the delivery time frames? Please follow the link to Shipping & Shopping for more information.INTERNATIONAL CUSTOMERS please note...when ordering please consider the order processing time frame ( within 3-5 business days) and delivery time frames...varies from country to country with DHL EXPRESS 3-5 business days. Click link to read more. Are there any Customs Duties & Vat/Taxes? Extract - SECTION 21 of our Terms & Services page. When a package is shipped internationally, it may be subject to import taxes, customs duties, and/or fees imposed by the destination country. These charges will typically be due once the shipped goods arrive at the country of destination. Import charges can vary widely but are most commonly based on the price and type of item, package weight and dimensions, origin country, and the taxes, duties, and fees of the destination country. You are responsible with ensuring to comply with laws and regulations of the country of destination. AfroShe® does not have any responsibility on these additional charges that may apply. Where can I find out more information about the list of ingredients? Once your order has been dispatched, you'll automatically receive your tracking information via email and also to your account (if you initially set one up). Be sure to follow the tracking information and adjust notification details. What is a VIP SAVER? Our VIP SAVER is our newsletter subscription that informs our customers on AfroShe® news, special deals and offers. You can subscribe via the home page by scrolling down and entering your details (it will not be shared with anyone/ third parties). AfroShe Rewards is a loyalty program that rewards our customers for their purchases and other actions. Our reward program gives each customer the flexibility and freedom to save up their points and redeem at their convenience. There are a number of ways to EARN points. CLICK on the tab at the bottom of the screen to learn more or create an account and start earning. If you already have an account your SIGNUP points should automatically be added up, otherwise contact us for correct amendments. 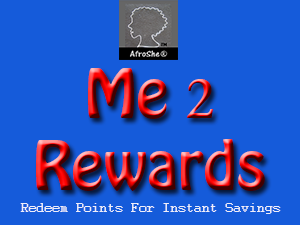 Welcome to AfroShe® Me 2 Rewards points program. Shop online, earn points and redeem them for INSTANT SAVINGS.